This card could have easily made my top ten most wanted list, had I known it existed. I saw this baby up for sale, and nabbed it quick. 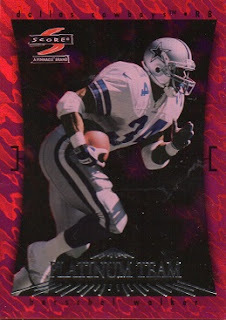 TCDB collectors told me it was just another of the many insert sets that Score had for football in 1997. In fact, I was told of yet another insert from this set called, "Premier Club". That set, and this one, feature 15 players from each team. Herschel is card #13 in each set. The fronts, I believe, are all the same photo, with various background differences. 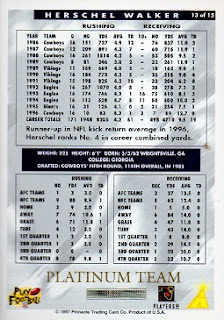 As I've mentioned, adding a card to the Hoard, especially from Herschel's playing days, which I didn't know about previously, pleases me to no end.